FILE - Pipes and valves are seen at an underground gas storage facility near Striy, Ukraine. Ukraine this week dismissed as unacceptable a natural gas transit proposal by Russian energy giant Gazprom, saying planned reductions in volume would yield amounts too small to make Russian gas transit economically viable. Ukraine this week dismissed as unacceptable a natural gas transit proposal by Russian energy giant Gazprom. Kyiv's move will further complicate efforts by Western European governments to persuade their Central European counterparts to withdraw objections to Nord Stream 2, a Kremlin-favored pipeline being built under the Baltic Sea to deliver gas from Russia to Germany without transiting Ukraine and Poland. The politics of Nord Stream 2 have become increasingly tangled amid heightened tensions between Europe and Russia. Suspicions are growing that the Kremlin wants to develop the new pipeline to reduce the importance of the one running through Ukraine — more for political reasons than commercial ones. On Monday, Ukrainian leader Petro Poroshenko dubbed Russia "an extremely unreliable partner" in energy provision. In an interview with a German newspaper, he also said Nord Stream 2 would provide the Kremlin with the opportunity to switch off at will the gas to Ukraine without disrupting supplies to Western Europe. Most of the natural gas Western Europe buys from Russia currently flows through Ukraine. Nord Stream 2 would replace an older pipeline under the Baltic Sea, and double by next year the amount of Russian gas delivered to Germany, the European Union's most powerful economy. German authorities have dismissed in the past Ukrainian and Polish objections to Nord Stream 2, and last month they issued the final permits needed for pipeline construction on German territory and in its territorial waters. Finland also has issued construction permits. 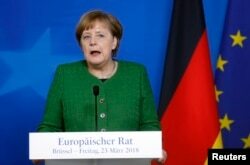 FILE - German Chancellor Angela Merkel speaks at a news conference in Brussels, Belgium, March 23, 2018. But after weeks of lobbying by Kyiv, and with growing pressure from within Germany's newly formed governing coalition, Chancellor Angela Merkel has started to harden her language about the proposed pipeline. It will cost billions of dollars to build and is planned to run 1,200 kilometers from Vyborg in Russia to Lubmin in Germany. Russia currently supplies more than one-third of the natural gas Europe uses, though with demand increasing that could reach closer to 50 percent next decade. In the past, Merkel hasn't acknowledged a geopolitical dimension when it comes to debating the benefits and drawbacks of Nord Stream 2. She brushed away Polish Prime Minister Mateusz Morawiecki's objections at a Berlin press conference in February. He warned of the dangers of Europe becoming too dependent on Russian energy and said Russia must "not be allowed to have a monopoly and force its prices on the European Union" or use the gas to blackmail EU governments. But after a meeting Tuesday with Poroshenko, Merkel acknowledged for the first time allies' concerns over the "political" and "strategic" aspects of the proposed pipeline, saying Nord Stream 2 could proceed only if Ukraine's role as a transit country for Russian gas also was protected. She said the earnings Ukraine receives for gas transit rights are of strategic importance. "That is why I have made it very clear that the Nord Stream 2 project is not possible without clarity regarding the transit role of Ukraine," she said. Ukraine and Poland aren't the only European countries objecting to Nord Stream 2. Baltic nations and Slovakia, as well as Sweden and Denmark, have expressed doubts about the project, both out of solidarity with Ukraine, which would lose about $3 billion a year in revenue once the new pipeline was complete, and over fears about Europe's growing dependence on natural gas supplies from Russia. That dependency, they fear, could make Europe vulnerable to geopolitical blackmail by Russia. It is a view shared by the U.S., which has urged Germany to be cautious about signing up to Nord Stream 2 and has promised to offer more U.S. gas to Europe. 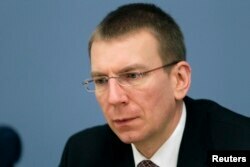 FILE - Latvian Foreign Minister Edgars Rinkevics attends a news conference in Riga, Jan. 25, 2012. NATO's former head, Anders Fogh Rasmussen, has described Nord Stream 2 as a "geopolitical mistake" for the EU, saying it would make a mockery of EU sanctions on Russia for its annexation of Crimea. Last week, the Trump administration included Alexei Miller, the CEO of Gazprom, which is 50 percent owned by the Russian state, on an expanded economic sanctions list. On Tuesday, Latvian Foreign Minister Edgars Rinkevics said that the Baltic states, Nordic countries and Visegrad countries had formed a bloc on Nord Stream 2 inside the EU. "We have always been united in our position regarding Nord Stream 2, and we believe that this is not an economic and business but a political project," he said. Authorities in Sweden and Denmark are still mulling whether to agree to construction permits. Last year, Denmark's parliament passed legislation that would allow the Danish government to ban the pipeline from going through the country's territorial waters. Gazprom said in March that it would terminate its gas contracts with Ukraine after a European court ordered the Russian giant to pay more than $2.5 billion to Ukrainian energy firm Naftogaz, concluding a long legal battle about prices and obligations. 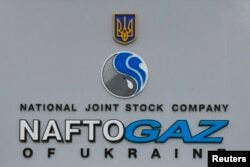 FILE - The logo of the Ukrainian national joint stock company Naftogaz is seen outside the company's headquarters in central Kyiv, March 15, 2016. But in a statement this week seemingly aimed at assuaging European doubts about the project, Miller, the Gazprom CEO, said his company had never envisaged stopping all transit through Ukraine and would maintain volumes of 10 billion to 15 billion cubic meters per year. Ukrainian Energy Minister Igor Nasalyk said Wednesday that those amounts were too small to make Russian gas transit economically viable. "Our country will not accept such volumes," he said. Ukrainian energy officials say Russia needs to pump at least 40 billion cubic meters of gas per year to make the transit route through Ukraine "economically profitable" for Kyiv. Last year, 93.5 billion cubic meters of Russian gas transited Ukraine to the rest of Europe — about half of the EU bloc's total purchases from Gazprom. Merkel's shift in language about Nord Stream 2 followed a series of highly critical remarks about Russia from Heiko Maas, Germany's new foreign minister. Ukraine argues the whole project is political, and Poroshenko said this week that his country's transit pipeline could be modernized more cheaply than the cost of building Nord Stream 2. Russian officials counter that it is European foes who are trying to turn natural gas into a political weapon by throwing up objections to the new pipeline project. They also contend that Europe will face gas shortages and price spikes next decade if the Russian energy giant isn't allowed to boost capacity.